Being alone in the hospital can be a traumatic experience, especially for children. And more than ever before, children in need of emergency treatment are being brought to Honolulu from all over Hawaii and other Pacific Islands for expert medical care. For over three decades, Ronald McDonald House Charities® of Hawaii has offered a loving home-away-from-home to families needing to be near their seriously ill or injured children while they're being treated at Honolulu area hospitals. Ronald McDonald House Charities® of Hawaii, Inc. is a registered 501(c)(3) non-profit organization, created in 1997 to expand the positive impact of Hawaii’s Ronald McDonald House (RMH) on the communities served. The House, which opened in 1987, has been and will always be RMHC-HI’s cornerstone program. The mission of RMHC-HI is to “Provide a home-away-from-home for seriously ill children and their families and to develop programs and partnerships aimed at improving the lives of children in Hawaii and the Pacific.” In short, RMHC-HI keeps families together when they need each other most so that they can do the most to nurture each other. No other Hawaii organization is set up to do what RMHC-HI does. Much of its success can be credited to the community, not only for monetary contributions but also the thousands of hours of personal time given by hundreds of committed RMHC-HI volunteers. Volunteerism is essential in achieving the RMHC-HI mission. RMHC-HI operates two residential facilities to assist families that have children with serious health conditions. They support those compelled to fly to Oahu for critical medical treatments not available on their home island. For neighbor island families, an ocean literally separates them from their child’s desperately needed medical attention. Lengths of stay vary widely at the overnight facilities depending on diagnosis but generally range from several days to several months. The overnight facilities strive to foster emotional, spiritual, and compassionate support to all who live within. Fred and Fran Hill at Judd Hillside for our 25th anniversary. 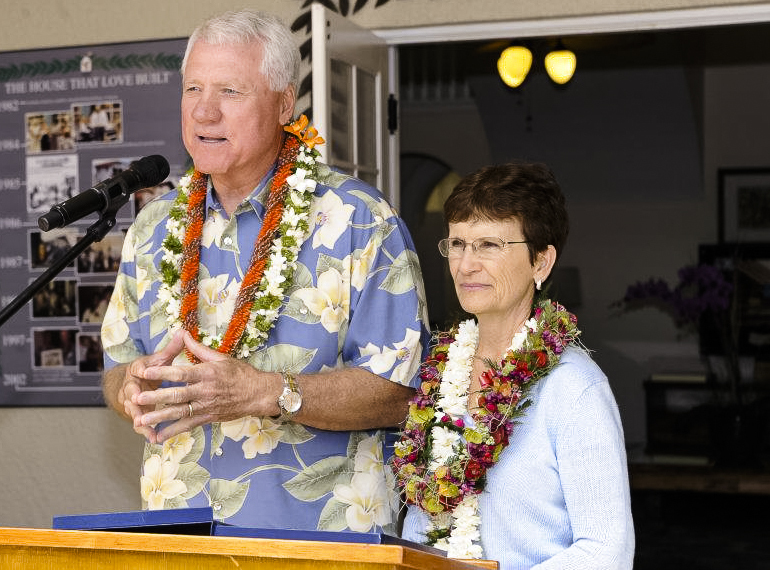 It all started in 1982, when a group of concerned citizens began work to open a Ronald McDonald House in Hawaii. The group was composed of parents of previously hospitalized children, medical personnel, business people, representatives of the Junior League of Honolulu, the March of Dimes, and the hospital Auxiliary of KMCWC. Based on their personal experiences and the testimony of nurses and social workers, there was an overwhelming need in Hawaii for an affordable, temporary “home-away-from-home” for the families of children hospitalized with serious life-threatening illnesses. Based on this need, the capital campaign for the project was hugely successful. The idea of a home for families of hospitalized children originated in 1973 in Pennsylvania when Fred Hill, a member of the Philadelphia Eagles football team, learned that his young daughter, Kim, had Leukemia. Through his and his teams efforts, and working together with many members of the community and local McDonald’s Restaurants, funds were raised and a House was opened in Philadelphia. The tremendous value and success of this first House sparked interest throughout the entire country and abroad, and the McDonald’s Corporation continued to be a major sponsor, helping support both the construction of new Houses and their ongoing expenses. It is to recognize this contribution that these Houses have taken the name of Ronald McDonald for the positive, helpful and fun-loving feeling that he inspires in children.